As we were leaving three-mile-long Grande Anse beach, a young, brawny man yelled angrily from a distance, “You not allowed to take pick-sha of da boass!” I ignored him. So he approached me, madder and louder. Hmmm. But maybe I can? Hey, I just did! And I’ll do it again—take that picture, ride that bus, drink in that bar, haggle for that fish, laze under that waterfall, kayak in those dodgy swells, home-school my children, and run away from the routine on another BreakAway adventure. When I snapped that photo, the third in about 55 seconds, nothing could stop me. Not even the gnarly, noisy group of teen boys who had been partying (rather than participating) all day in the shade of a sprawling seagrape tree. What were those photos? Three homemade boats that came into my path, rather like three beached angels, as we were leaving the seashore. 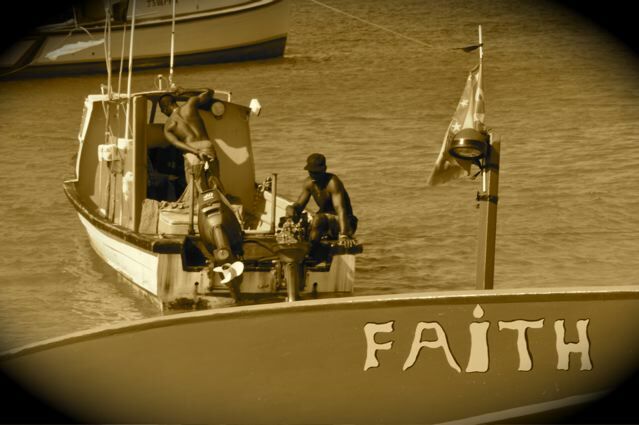 All boats get names in the Caribbean, and the three that lined up at that moment were: Faith. Give Thanks. Destiny. On this dazzling day on Grenada’s longest and most illustrious beach, the annual sailing festival of “workboats” (homemade, from plywood, bamboo, and sailcloth) had been racing for hours. 1,000 Grenadians of all ages were competing, boating, dancing, swimming, splashing, partying, feasting, and celebrating island tradition and bliss. Lucky ducks. When dreaming and scheming a Sabbatical, visions of days like this—exactly like this—keep me striving to achieve the eventual goal of freedom, however fleeting. Freedom of time. Freedom from worry. Freedom from stuff. Freedom to wander. Freedom of thought. It is a free world, right? So we’re told. Yet to my constant amazement, folks forget that. As do I. We are, after all, only human, an often-fussy species. So instead of freedom, we feel the fear. Rather than celebrate our riches, we go deeper into debt. Born with authenticity, we choose to conform. When we could be thankful, we become resentful. When we could take a leap, we stay put. When blessed with enough, we get greedy. Well, I’m greedy too. But on my better days, my desires lean toward time (not money). Autonomy (not conventionality). Experiences (not possessions). And possibility (not entitlement). So that antagonistic young Grenadian who came at me obviously didn’t know me, what I stand for, or why I took that picture. He’s right: There are times in life you need to ask permission, as I would have before aiming the camera at him. The first boat that made me stop and snap a picture, Faith, is the one to climb aboard in order to set your course toward a Sabbatical. If you hold the hope that—someday—you can launch yourself into a bona-fide BreakAway, the wind is at your back. Maybe that’s what faith is? Time to—really!—rest and relax. In unprecedented quantity and quality. “Just what the doctor ordered.” Such peace of mind doesn’t last; jobs and kids and gridlock will see to that. But at least unfettered serenity is attainable now and then. The friends, family, clients, acquaintances, and others who helped make this BreakAway possible. 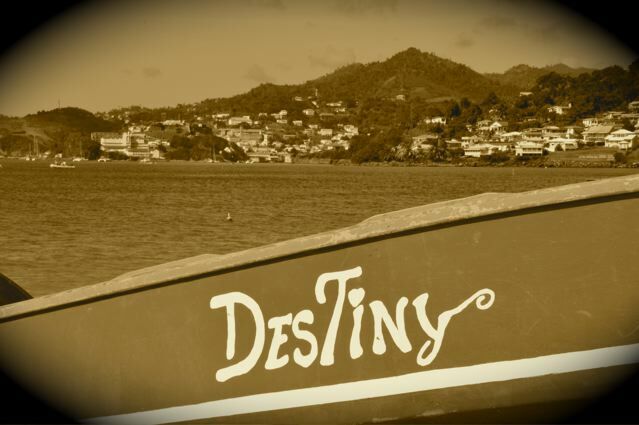 Destiny, like a destination, is what you steer toward. Fate, on the other hand, is more what happens to you—both “smooth sailing” and “man overboard.” Destiny suggests providence. Fate connotes predetermination. Life seems to offer both—but destiny keeps us aware of where the breezes can blow us. Fate fosters acquiescence. I was destined to take these pictures; that angry tween boy must accept that fate! But no one can take away my experience of that joyous festival, or make me forget that idyllic memory, or steal my right to drift toward the destiny of my choosing. Dang, I hated to leave that sailing festival. Hate to end this BreakAway. Hate to stop this travelog. But alas, what a nasty word, hate; mixed emotions are racing like sailboats on a blustery day. But my heart (an overused word I try not to use) is unusually calm. Warm. And in awe. It’s full of faith, gratitude, and alignment. Hey, if that’s my destiny—if only for a few hours on some of these 69 days—taking Sabbaticals is worth all the risk and hassle. Just ask that inner voice that sometimes whispers brilliant things. But enough of this. Time’s up. Anyway, I rarely enjoy reading psycho-spiritual, navel-gazing babble. My eyes tend to roll back in my head. The countless writers that exploit lingo like “heart,” “authenticity,” and “aligned” have gotten little attention from me. Guess that’s why I’ve got to write my own. I hope you are too. And that your eyes are still in your sockets. Thanks, dear reader(s), for listening. And traveling with me. May we both ignore the folks who say, “You can’t do that!” and seek out some sublime destinies. Keep the faith. And happy sails. Get automatic updates when we add new content. You can choose RSS (via via your favorite feed reader) or just enter your email below. FOTOFRIDAY: Pretty! But What Is It? BITN: Quit? Vacation? Or Sneak a Sabbatical? 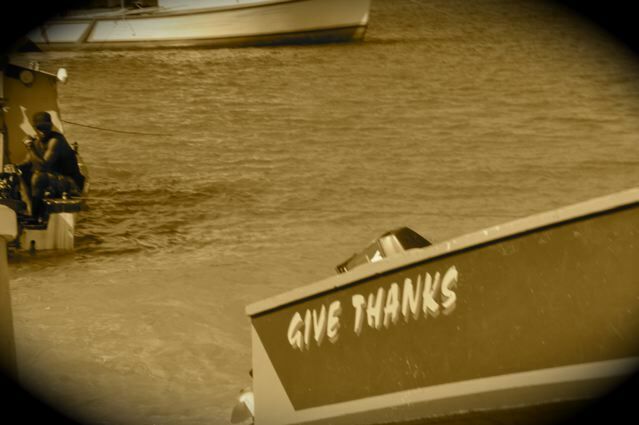 Here's my son’s blog from an '08/09 BreakAway in the Caribbean. In 00/01, when the internet was a pup, I went RTW and posted these words and pics en route. BITN: Billionaires & Sexless Women BreakAway Bigtime; Americans Broke!